Kushner, a quiet insider who generally avoids the spotlight, was the first top Trump lieutenant to be quizzed by the congressional investigators probing Russia’s meddling in the 2016 presidential election. The wealthy developer-turned-presidential adviser spoke privately with staff members of the Senate intelligence committee and will return to talk to the House intelligence panel Tuesday. 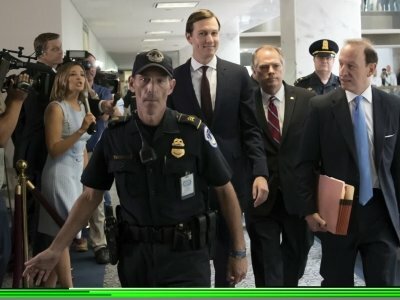 Earlier Monday, Kushner released an 11-page statement that was billed as his remarks to both the Senate and House committees. In it, he acknowledged his Russian contacts during the campaign and then the following weeks, in which he served as a liaison between the transition and foreign governments. He described each contact as either insignificant or routine and he said the meetings, along with several others, were omitted from his security clearance form because of an aide’s error. Kushner cast himself as a political novice learning in real time to juggle “thousands of meetings and interactions” in a fast-paced campaign. His statement was the first detailed defense from a campaign insider responding to the controversy that has all but consumed the first six months of Trump’s presidency. U.S. intelligence agencies have concluded that Russia sought to tip the 2016 campaign in Trump’s favor. Congressional committees, as well as a Justice Department special counsel, are investigating whether Trump associates coordinated with Russia in that effort and whether the president has sought to hamper the investigations. He provided for the first time his recollection of a meeting at Trump Tower with a Russian lawyer who was said to have damaging information about Trump’s Democratic rival, Hillary Clinton. Emails released this month show that the president’s son, Donald Trump Jr., accepted the meeting with the idea that he would receive information as part of a Russian government effort to help Trump’s campaign. But Kushner said he hadn’t seen those emails until recently shown them by his lawyers. He called the June 2016 Trump Tower meeting with Russian lawyer Natalia Veselnitskaya such a “waste of time” that he asked his assistant to call him out of the gathering. He says he arrived late and when he heard the lawyer discussing the issue of international adoptions, he texted his assistant to call him out. “No part of the meeting I attended included anything about the campaign; there was no follow-up to the meeting that I am aware of; I do not recall how many people were there (or their names), and I have no knowledge of any documents being offered or accepted,” he said. Kushner said that when Kislyak asked if there was a secure way for him to provide information from his “generals,” Kushner suggested using facilities at the Russian Embassy. “The ambassador said that would not be possible and so we all agreed that we would receive this information after the Inauguration. Nothing else occurred,” the statement said. He also acknowledged meeting with a Russian banker, Sergey Gorkov, at the request of Kislyak but said no specific policies were discussed. In an effort to demonstrate how distanced he was from international diplomacy, Kushner said in his statement that he “could not even remember the name of the Russian ambassador” when he wanted to verify an email purporting to be an official note of congratulations from Russian President Vladimir Putin on the day after the election. On another matter, Kushner described receiving a “random email” during the presidential campaign from someone claiming to have Trump’s tax returns — which the president hasn’t released — and demanding ransom to keep the information secret. Kushner said the emailer demanded payment in Bitcoin, an online currency. Kushner says he showed the email to a Secret Service agent, who told him to ignore it. Trump Jr. and Trump’s former campaign manager, Paul Manafort, who was also at the June 2016 meeting, were scheduled to testify before the Senate Judiciary Committee this week. But on Friday their attorneys said they remained in negotiations with that panel. The two men are now in discussions to be privately interviewed by staff or lawmakers, though the GOP chairman of the committee, Iowa Sen. Chuck Grassley, has said they will eventually testify in public. Associated Press writers Chad Day, Eric Tucker, Kevin Freking and Vivian Salama contributed to this report.